2010 – Grand opening of new Terminal B, consolidated rental car center, and renovation of Terminal A. Program completed ahead of schedule and under budget. 2010 – Terminal C is demolished to make way for more parking for Terminal B. 2011 – Final elements of Terminal Area Improvement Program completed with the opening of new Economy, Hourly, and Daily parking lots. West side long-term parking lot is closed to prepare for future redevelopment for general aviation services. 2019 - SJC celebrates 70th birthday on 2/1/19. Watch video of SJC grow and change through the decades. 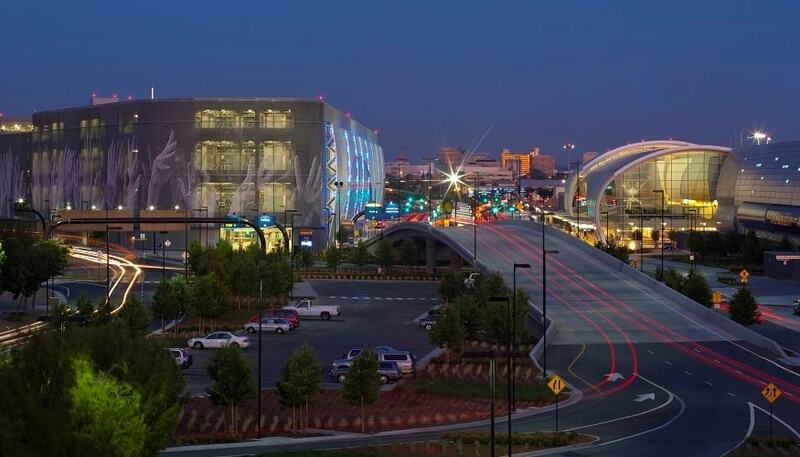 2000 – Passenger traffic hits an all-time high of 14.2 million passengers per year during the Silicon Valley dot.com boom. 2001 – City Council approves naming the airport to “Norman Y. Mineta San José International Airport” in honor of the former Mayor and long-term Congressman. 2002 – Passenger traffic falls sharply to 10.1 million per year following the dot-com bust and 9/11 impact on aviation and national economy. 2004 – Groundbreaking for the North Concourse, the first phase of the planned comprehensive replacement of all SJC terminal facilities. 2005 – City Council reduces scale of modernization program from estimated $4.5 billion ten-year plan to $1.5 billion, four-year program in response to lower projections for passengers and revenues. 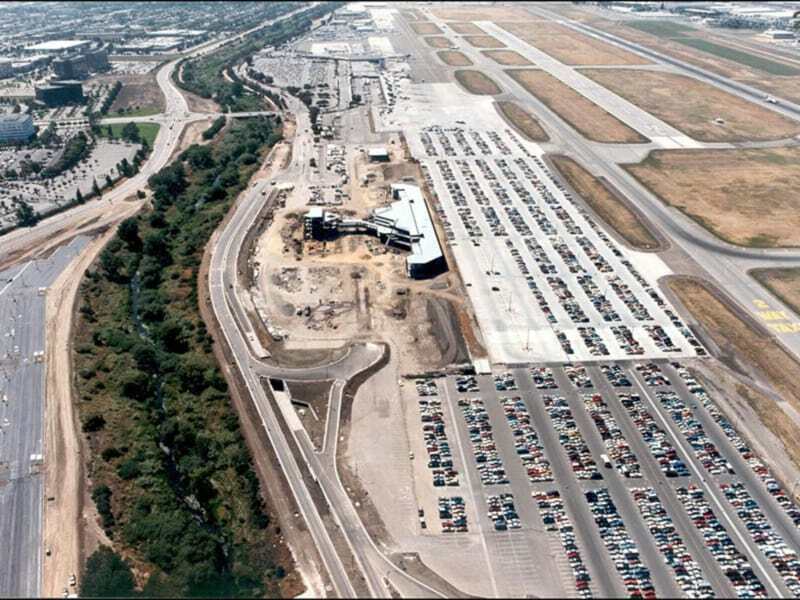 2006 – Construction begins on the revised Terminal Area Improvement Program under a design-build contract with Hensel Phelps Construction Co.
1990 – Terminal A opens to accommodate six million passengers a year. 1990 – American Airlines starts service between SJC and Tokyo. 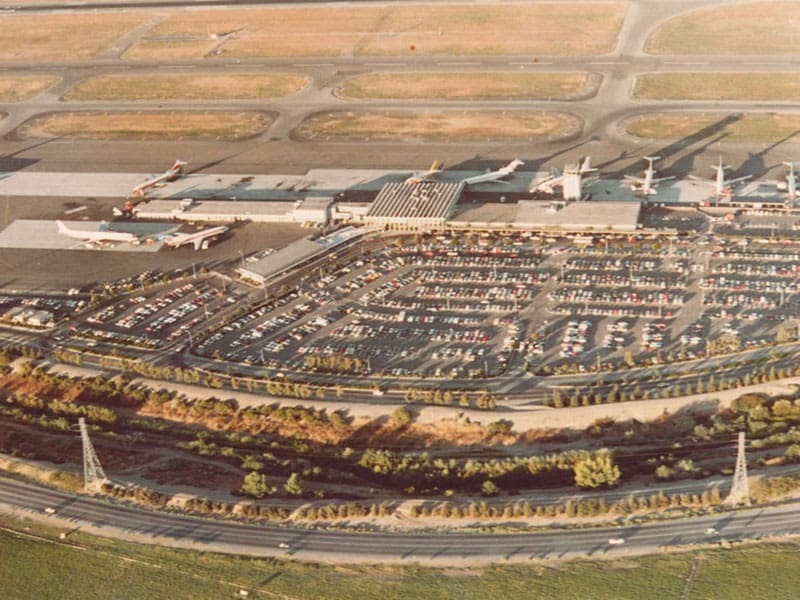 1997 – City Council approves new airport Master Plan to guide long-term expansion. 1984 –The City of San José implemented the Airport Noise Control Program to establish a nighttime curfew for certain aircraft operations. 1970s –Third runway opens on the west side for general aviation. 1974 – San Jose Mayor Norman Y. Mineta elected to Congress representing San Jose and Silicon Valley and was instrumental in obtaining funds for the San José Airport and Santa Clara County’s public transportation system. 1977 – California artist Millard Sheets unveils a 20- by 30-foot mural in the main terminal depicting a millennium of Santa Clara Valley history. The mural is a gift from the San Jose Mercury and San Jose News in honor of the 200th anniversary of the founding of San José and the 125th anniversary of the establishment of newspapers. 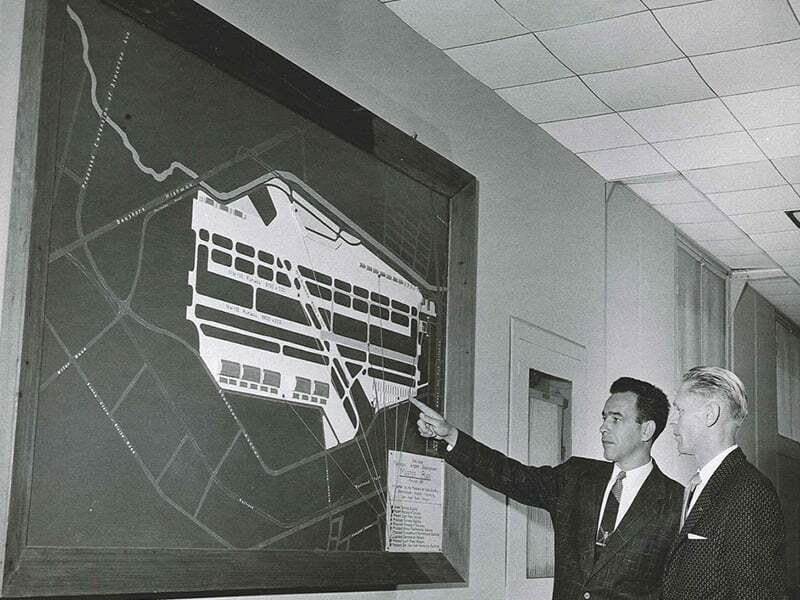 1960 – Radar and Associates recommends building an airport terminal to handle an passenger projections of 500,000 annual by 1967 and one million per year by 1970, and also extending the existing runway by almost 3,000 feet. 1961 –West runway is extended by 2,500 feet to accommodate larger aircraft and a new 4,400-foot east runway is added. 1963 – The San José Municipal Airport Commission is formed. 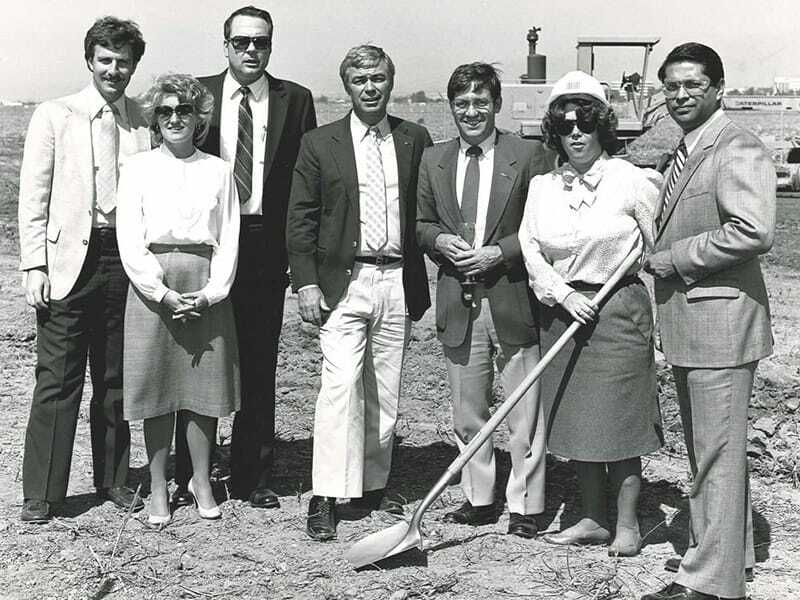 1964 – Groundbreaking ceremonies for the new airport terminal construction held on April 27. Tower controllers announce the airport’s millionth flight on July 6. San José State University Aeronautics Program moves to a five-acre site on airport land on Coleman Avenue. 1965 –New SJC terminal opens, later designated as Terminal C.
1966 – Pacific Southwest Airlines inaugurates jet airline service from SJC, and other airlines soon follow. 1967 – United, Western, American, Trans-World and Delta Airlines open ticket counters in the new airport terminal. 1968 – Annual passenger traffic hits one million, two years earlier than the 1960 projection. 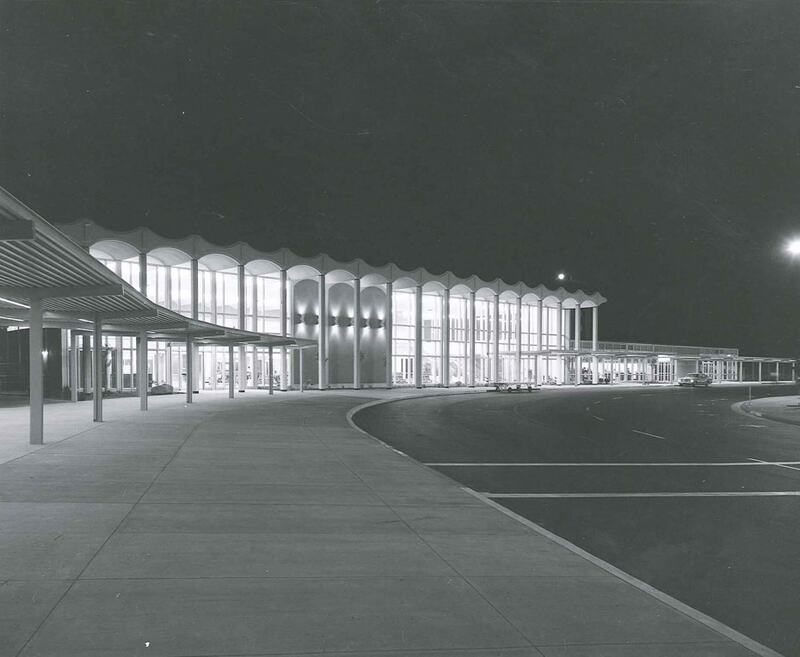 1969 –South Concourse of Terminal C is added for more airline gates and offices and the ticketing wing is expanded. SJC begins transcontinental service with United Airlines providing services to Chicago, Washington, D.C., and New York. 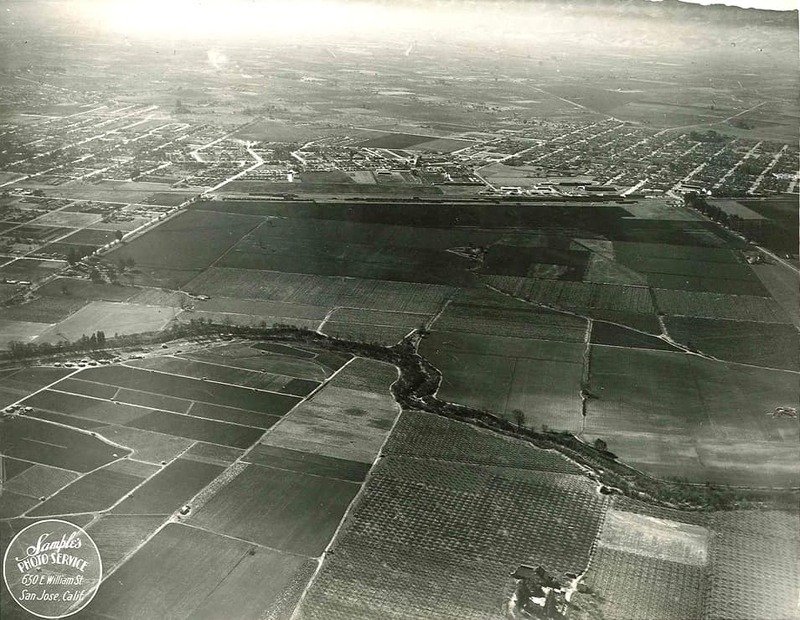 1953 – San José City Council appropriates over $270,000 for airport expansion, allowing the purchase of 76 additional acres of the Crocker Estate north of Brokaw Road and approved purchase of another 63 acres north of Kifer Road and south of Bayshore Highway. 1955 – SJC has one runway, power lines still looped across airport land, and the Guadalupe River east of the airport not yet realigned. 1957– City builds a six-story aluminum air traffic control tower. San José voters approve a $3.5 million bond issue to finance runway expansion, construction of a new administration building, purchase of the remainder of needed land, and removal of obstructions. Federal funds are allocated for the realignment of the Guadalupe River. 1958 – Fifty three acres is added to the airport with purchase of land north of Brokaw Road between Kifer Road and the Guadalupe River. 1959 –City of San José hires Radar and Associates, an engineering firm, to study the needs of the airport and develop a master plan. 1940 – CAC finances $300k bond and City increases tax rate to buy 483 acres north of San José, the Crocker Estate. 1941 – World War II delays start of airport development. 1944 - Ernie Renzel, Jr. is elected to the San José City Council and serves one year as "President of the Council" (also known today as the Mayor). 1945 – Jim Nissen leases 16 acres of SJC land for a small aviation business, “California Aviation Activities,” and builds first dirt runway. General aviation is the only function of the airport. 1946 – City approves development of the San José Municipal Airport and applies for federal aid to build the airport. The city authorized Southwest Airways to stop in San José on flights between San Francisco and Los Angeles for certain size aircraft. Jim Nissen sells his share of “California Aviation Airlines” and becomes the first Airport Manager. 1947 – City is tentatively allocated over $100,000 in federal funds to begin construction on airport. 1948 – Construction on first permanent runaway through a federal airport grant. 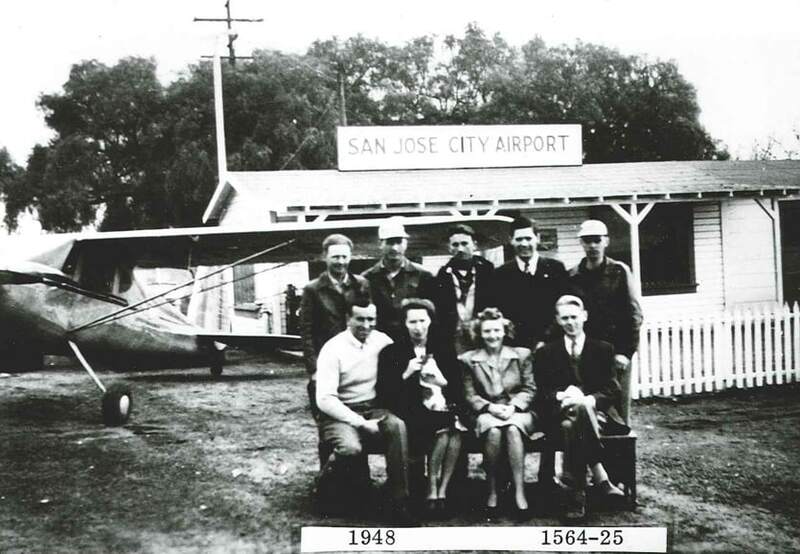 1949 – Dedication ceremonies of the San José Municipal Airport were held after ten years of airport development efforts. First commercial airline flight lands at SJC. Southwest Airways DC - 3 with two pilots, seven passengers and 2,550 baby chickens. Only the chickens got off at San José; the human passengers continued to Los Angeles. 1938 – US. Bureau of Air Commerce officials approve a site in the Laurelwood area north of San José for emergency landings when San Francisco was fogged in since San José averaged only 18 foggy days a year and it would dissipate by 10:00 a.m.
1939 – A new Citizens Airport Committee (CAC), led by Ernie Renzel, Jr., selects the site for the future home of SJC. 1928 – San José voters reject a $400,000 bond proposal for a municipal airport. 1929 – A Citizens Airport Committee (CAC) was formed to seek out suitable properties for a municipal airport and obtain financial support of it.